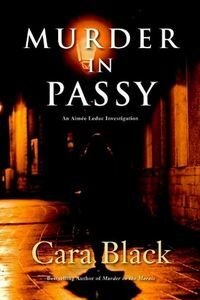 Murder in Passy by Cara Black: Synopsis and Online Purchase Options. Synopsis (from the publisher): The village-like neighborhood of Passy, home to many of Paris's wealthiest residents, is the last place one would expect a murder. But when Aimée Leduc's godfather, Morbier, a police commissaire, asks her to check on his girlfriend at her home there, that's exactly what Aimée finds. Xavierre, a haut bourgeois matron of Basque origin, is strangled in her garden while Aimée waits inside. Circumstantial evidence makes Morbier the prime suspect, and to vindicate him, Aimée must identify the real killer. Her investigation leads her to police corruption; the radical Basque terrorist group, ETA; and a kidnapped Spanish princess.